Haverhill once had a reputation for being the poorest and scruffiest of Suffolk towns, but over the last few years this reputation has become very ill-deserved. The main street has been pedestrianised with attractive public sculptures, and coming here on a Saturday morning after a couple of years absence I thought it now a busy little place, the market in full swing and people from the country villages chatting on the benches and in the cafés. Haverhill is surrounded by the loveliest area of East Anglia, with attractive, secretive villages huddling in the gently rolling hills, but for too long the town has been the hole in the middle of the doughnut. Many people could tell you that the big four towns of Suffolk are Ipswich, Lowestoft, Bury and Felixstowe; few would know that Haverhill is the fifth biggest, I suspect. It gets something of its character from its proximity to Cambridge, where many people go to work, but it escapes the character of a dormitory town by retaining its industrial base. On the streets, as in any East Anglian town, you hear the local accents competing with Eastern European tongues, but there are also older people with the voices of the East End, for Haverhill was, like Sudbury, a London overspill town. Unusually, the borough boundaries are marked by borders with two other counties, Cambridgeshire and Essex. Indeed, the industrial area of Haverhill is partly in Essex, although beyond it are some of the loveliest parts of that equally-maligned county, the Bumpsteads and the Sampfords, and the gentle clay country stretching away from more familiar East Anglian chalk uplands. 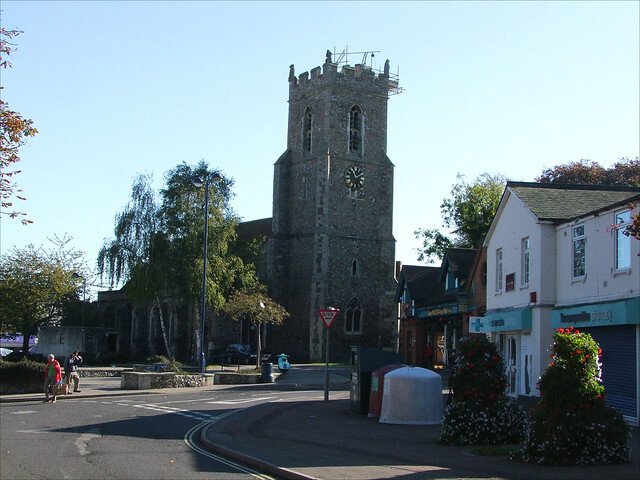 One might conclude that, although Haverhill is in Suffolk, it doesn't feel of it, and there is no doubt that the town is still uncharacteristically poor, especially when compared with nearby Newmarket. In Suffolk, we expect that the further west we go the richer it gets, but Haverhill is very much the exception that tests the rule. When I last came this way, St Mary's church was undergoing a refurbishment, and because of this I was not able to get inside. That is now complete, and this church is open every day. Externally, the two most notable features are the Stour Valley stair turret that rises above the level of the tower top, and the rood loft stair turret, as at nearby Clare and Stansfield. However, when you learn that, as at Beccles and Bungay, the interior was effectively scoured by a major town fire in the 17th century, and little survived, you might not have high expectations. In fact, the interior is rather wonderful. The western third of the nave has been filled with a wood-and-glass-walled café, which sits neatly beween the arcades without imposing too much. The chancel and chapels to the east are bright and richly coloured in the Anglo-catholic tradition. Everything has been restored and renewed in the makeover of the early 21st Century. The font, with its excellent cover by Frederick Gibberd, famous as the designer of the Catholic Cathedral in Liverpool but also the architect of Haverhill's considerable post-war expansion, has been moved into the east end of the north aisle. The south aisle chapel is stunning; the blessed sacrament is reserved here, and rows of candles burn in front of the screen. I found it very difficult to take photographs, simply because a constant succession of people were coming in to light candles. It really felt as if this was the beating spiritual heart of the town around it. The windows are filled with coloured glass. The life-sized figures in the south aisle must always have been imposing, and with the space within the nave shortened they dominate rather uneasily. Perhaps I was just not used to them. There is also a portrait of the puritan hothead Samuel Ward, famous as town preacher of Ipswich. But during the Commonwealth he had fulfilled the same role here, and his father was Rector. Haverhill's puritan credentials were confirmed in the 19th Century, when it was a hotbed of non-conformism. This was to such an extent that, in a town of more than 3,000 people as it was in 1851, the Census of Religious Worship that year recorded a regular congregation at St Mary of of barely 200, about 8% of the population and the lowest rate of Anglican observance in any East Anglian town. This compared with more than 500 at the Baptist chapel, and another 500 at the Congregational chapel. Haverhill's enthusiastic non-conformism would result in the building later in the century of Suffolk's most spectacular Congregationalist church, the bespired and beturreted palace at the Sturmer end of the town centre, now the United Reformed Church. Visitors may easily confuse it with the parish church, which keeps rather a lower profile at the other end of the High Street. I left Haverhill under the railway arches of the former Colchester to Cambridge line - but the railway has gone now, killed in the 1960s when oil prices were low and motorways seemed an exciting idea. Now, Haverhill is one of the largest towns in England without a rail service, and anyone wanting to travel by train between Colchester and Cambridge, two of East Anglia's largest towns, must either go via London or dot about on Ipswich and Bury local services for a couple of hours. So short-sighted.